As reported last week Team Lotus has today confirmed their takeover of iconic British sportscar maker Caterham Cars. 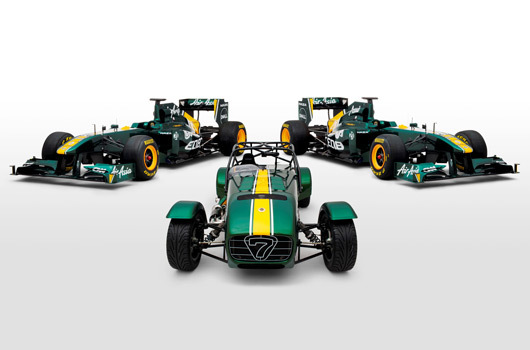 Team Lotus Enterprise, led by Tony Fernandes, Kamarudin Meranun and SM Nasarudin, promise to take Caterham on a new and exciting journey that will embrace both its proud Lotus Seven legacy and the high profile of Formula One. Speaking about his new venture, Fernandes enthused, “Caterham Cars has remained wholly faithful to Colin Chapman’s philosophy of ‘less is more’, and the DNA of the original Seven can still be traced to the newest additions to Caterham’s product offering. It’s going to be really interesting to see how this journey progresses. The full presser from Caterham, along with an emotional promo video, can be seen after the break. 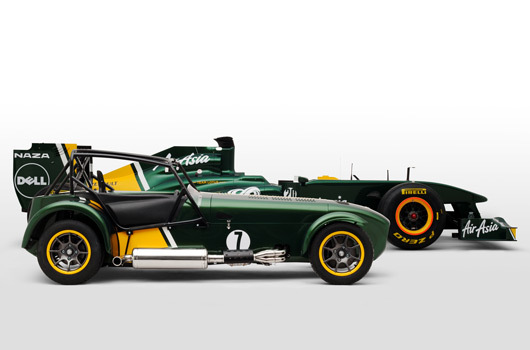 The acquisition of Caterham Cars by Team Lotus Enterprise will not only signal the continued development of the legendary Seven, but will provide Caterham with the platform to apply its philosophy of ‘adding lightness’ to exciting new models for the 21st Century. This exciting new era for Caterham will be led by the company’s existing management team, headed up by Caterham Cars Managing Director, Ansar Ali. Ansar’s direction has been responsible for energising Caterham’s export prowess during the last five years, creating the iconic Superlight R500 – Top Gear’s Car of the Year for 2008 – and Caterham’s first brand new model in 15 years, the stunning SP/300.R sports prototype racer. As custodians of Colin Chapman’s two-seater Seven since 1973, Caterham has been responsible for the evolution of a car originally conceived as a ‘fit for purpose’ race-car for the road in 1957. Today, the Seven is arguably the benchmark for the perfect balance between power and intuitive, user-friendly handling, and in spite of its years remains one of the most raced cars in the world. It has also been the inspiration for the recently-launched Caterham-Lola SP/300.R for the race and track day community. Tony Fernandes said: “Caterham has a unique place at the heart of the motoring world. As well as being proudly and staunchly British, it has an enviable and uniquely unblemished reputation within the industry for performance, handling and engineering excellence. “Caterham Cars has remained wholly faithful to Colin Chapman’s philosophy of ‘less is more’, and the DNA of the original Seven can still be traced to the newest additions to Caterham’s product offering. Caterham Cars, Managing Director, Ansar Ali, added: “This is yet another exciting chapter in the Caterham story. Until now, the resources Caterham has had at its disposal have, naturally, limited the exposure of the Caterham experience and the legendary Seven has had to rely almost entirely on its remarkable reputation and legacy. “We will remain entirely true to the philosophy that we, as custodians of one man’s motoring concept, have protected for nearly 40 years. “However, the acquisition of the company by Team Lotus Enterprise will allow our existing management team to take Caterham’s core spirit of pure driving enjoyment to a hitherto un-served audience. There will be Caterham sponsorship added, and if the court case goes south for Fernandes and his crew then expect to see a total rebranding of Team Lotus to Team Caterham, or somesuch. However, I expect they’ll hang on to the Team Lotus name in F1 for as long as they can.